Glasslined Coated Inner Tank, 5 Star Rated, Available 35 and 50 L in Right Wall Installation, Suitable for High Pressure and Pressure Pump Installations. 150632 Glasslined Coated Inner Tank, 5 Star Rated, Available 35 and 50 L in Right Wall Installation, Suitable for High Pressure and Pressure Pump Installations. 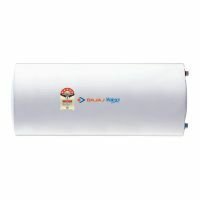 Bajaj majesty is a 35 litre is an instant water heater which comes with Special Protection Device attracts harmful salts and keeps the element and tank healthy and safe from corrosion. It is High Effeciency and long life Incoloy Heating Element. It's inner tank is glass lined coated that prevents corrosion and Multiple safety systems for protection against dry heating, over heatuing and over pressure. To Recieve updates and possible rewards for Bajaj Majesty 35 L GMH please sign in. To Recieve updates and possible rewards for Geyser/Water Heater please sign in.